Here’s a good example of why multi-use paths don’t work. I took this photo in Frankfurt last spring. 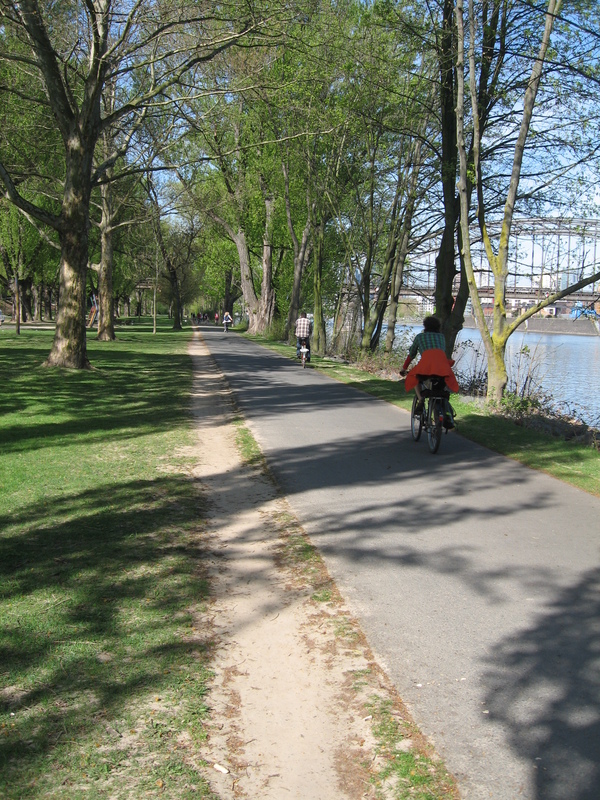 This asphalt path runs along the river Main, stretching out from the city center through some lovely wooded land. I’d guess most use is recreational but people do commute on it. It’s wide by American standards, plenty of room for two-way cycling traffic, but it fails because it’s multi-use. It doesn’t delineate between pedestrians and cyclists and so even with all that asphalt, people have carved out this dirt rut to one side. That’s where the runners go when the cyclists come in both directions or where the cyclists go to get around strolling pedestrians. Why do we build paths like this? It’s clearly not a space issue and it’s clearly not working for its users—they’ve gone and trod out the separation they need. I don’t have any idea how well it works in Germany, but on paths like this here the mixing only encourages conflict. I see it all the time on our rails-to-trails paths, pedestrians and cyclists yelling at each other, playing chicken—our state paths mandate pedestrians walk against on-coming cycling traffic, so this chicken game happens at nearly every interaction. Paths are supposed to be the place cyclists go to get away from the dangers of road traffic, places of high subjective safety. But when pedestrians aren’t separate those same dangers are present, they just move a lot more slowly. I think in some cases there are limits to space, such as along RR corridors with private land on both sides, but with those types of paths like the one you show in the photo, especially in the US, the intent and design was one of recreation and not as a conduit for efficient movement of utilitarian cyclists. I understand pedestrian frustration at maniac cyclists on such trails, but I am also frustrated myself when I’m a cyclist trying to get home from work on a path clogged with pedestrians. I’ve been both and am equally frustrated by other users any time I’m on the MUP. In the Denver area you also get to add in equestrians, even on paved trails, and that really just fouls the mix. I get the intent is typically in servicing recreation, but I don’t think that excuses bad design. There’s a reason riding a bike on a New York City sidewalk is illegal—as soon as pedestrians reach even a minimum density, riding in that space becomes pretty dangerous for everyone. They have similar paths in Madison, and while the dirt rut is still ever-present, I haven’t experienced any animosity while using them (as biker, walker, or runner). I experience a lot more animosity while riding with traffic. Perhaps that’s because there are so many walking paths these roads aren’t really very packed with pedestrians, perhaps it’s because Madison is really quite bike-friendly, perhaps it’s because and most of those walkers bike at some point and so are willing to ‘step off’ and everyone is pretty communicative (almost everyone says ‘on your left’ and I’ve only had one walker react angrily when I did – I had plenty of room, he didn’t even have to move at all I just didn’t want him to step into my way). In Milwaukee, they are slowly getting more dedicated bike paths, and though they are used rarely by walkers and slightly more often by runners, everyone understands bikers have right-of-way. Maybe that’s a better system for most cities to follow; look the other way when runners use the trails, but understand they are there for *biking* and act accordingly. I think you’ve hit on it—the difference in my experience here is the right-of-way is totally unclear. Pedestrians and cyclists each believe they have it. I don’t think it helps that the literature and signage calls them all “Bike Paths” but at the same time encourages pedestrian use. Still, I’ve only seen mixed use work on whole streets where car traffic is either banned or discouraged to the extent that drivers avoid them. Then it does okay because the space is wide enough to accommodate everyone without strict delineation. By the way: love your shop! Was in last winter. Did all I could not to leave with a Brompton.